The Q.care on-demand platform provides hospitals with a White Label app for offering remote nurse triage and house calls to pediatric patients. Offered by the startup company PediaQ, it gives users a convenient way to schedule home visits from pediatric nurses for urgent care-type issues. As experienced health care operations experts, the founders of startup PediaQ knew there was a better way to provide on-demand after-hours pediatric care to anxious parents, reducing unnecessary emergency room and in-office doctor visits. 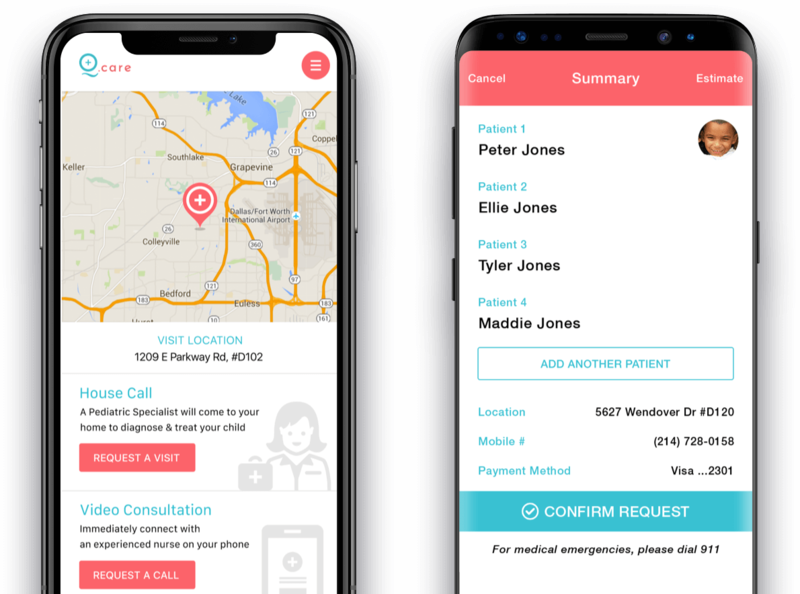 Mobile apps offered an ideal way to connect parents and practitioners, especially once urgent care centers close for the day. Now, all that remained was defining the service and developing end-to-end infrastructure to make it work: the Q.care service and apps. As requirements for the introductory Q.care service matured, Reinvently acted as PediaQ’s “CTO-as-a-company,” looking for mobile and back-end infrastructure elements that could support the service both at MVP and beyond. Compliance to HIPAA regulations requires significant security and privacy for Protected Health Information (PHI). Reinvently researched and defined the iOS architecture and approach used to ensure HIPAA compliance, then implemented it as part of the Q.care MVP. As an on-demand medical service working directly with patients, Q.care used DrChrono to support EHR, scheduling, billing and web capabilities. Reinvently identified and implemented all API integration and data synchronization requirements for seamless web-mobile operation. Having a mobile service means taking mobile payments in a modern, mobile-optimized way. PediaQ and Reinvently chose Braintree and its superior user experience and operational efficiency, customizing it for the Q.care service through its extensive iOS SDK toolkit. Clear planning and transparency are vital for a successful MVP. With PediaQ starting its marketing campaign for launch of Q.care, Reinvently had three months to develop its end-to-end MVP, including HIPAA-compliant iOS app, backend and outside integration. PediaQ’s MVP phase was designed to test the Q.care service concept, relying on Reinvently iOS apps for both patient and nurse practitioner portals. This included easy-to-use online service ordering and payment via the patient app. The Nurses’ app also supported EHR access, service billing and patient assignment, making it simple to manage cases in realtime. All work ensured careful HIPAA compliance while supporting end-to-end service flows with backend systems via APIs and SDKs. Beyond necessary backend integration with important 3rd party systems, Reinvently also developed and implemented backend database solutions to manage clients and nurse practitioners within the Q.care solution. This included a web admin panel for order tracking and other back-office functions. Launching Your Mobile-First Healthcare Startup?Transforming Your Current Healthcare Business? Throughout the MVP process and beyond, PediaQ and Reinvently defined multiple features and use cases for the Q.care service that had not been implemented for MVP. PediaQ’s success with funding its roadmap led to Continuous Product Development improvements to the service as it continued to expand into new geographic markets. An important enhancement for PediaQ was adding secure, reliable, high quality video to the Q.care service for its new Video Consultation service offering. Reinvently integrated Twilio Programmable Video on its iOS apps, quickly implementing a secure end-to-end video capability that helped provide better patient-provider care on iOS. Multiple feature additions improved Q.care’s iOS user experience as the service continued to mature. Google Map integration enabled patients to track the location of nurses and nurses to get directions to patient locations. A new Waiting List feature implemented a unique, patented algorithm for managing service availability with an informative and engaging user interface. Notification Center capabilities supported quick user data updates even for recently offline users, ensuring a highly responsive user experience, even in spotty coverage. Multiple user interface modifications improved patient and practitioner satisfaction and efficiency based on KPIs and analytics collected. PediaQ’s Continuous Product Development needs included service improvement in several areas, including better insurance integration and simplified payment workflows identified as issues during MVP. Multiple Web Admin Panel improvements also simplified service administration even as the Q.care service added more functionality and improved integration with DrChrono. As PediaQ gained experience with Q.care, adding services and improving overall user experience for its service, they began to partner with larger hospitals and regional health providers. The best strategy for expanding the service was to adopt a White Label B2B business model, where multiple health systems and hospitals would offer a customized service for their patients. And those new PediaQ clients had new needs. Adopting a B2B model meant significant changes to Q.care service workflows. Reinvently modified the service to identify service provider based on zip code, allowing one implementation to support multiple health systems. PediaQ also integrated a split payment system to enable monetization for both themselves and their health system clients. And to improve services for hospitals and patients, Reinvently integrated PokitDok to enable insurance eligibility and claims management for nearly all payers in the U.S. Since new Q.care service providers sought wider availability for their new service, Reinvently developed new Android and web applications for Q.care, mirroring available functionality on the iOS patient app. To offer better branding and messaging for its different hospital clients, Q.care implemented White Label user interfaces on all apps. B2B requirements also drove implementation of hospital-specific integrations to EHR and other systems, as well as payment and Web Admin Panel customizations. Want a Mobile Product That Will EvolveAs You Grow Your Business?